So the missus and me drove across the river to participate in the March for Science yesterday. No, not the Potomac River. We don’t live near Washington, D.C. anymore. The river in this case is the Connecticut River and the place was Kendrick Park in the town of Amherst, Massachusetts. You know, where the spinster Emily Dickinson wrote all that love poetry to imaginary lovers. We weren’t alone. Mostly we sat around with hands in our pockets as other marchers filed into the park. Some had signs. Some were in costume. One young kid was dressed as an astronaut. One man dressed as Ironman. There were some people in uniform. No, not cops. Actual scientists. We also had some medical professionals. Anyhow, they wore white lab coats. Slowly what looked like a couple of hundred people at best grew into a much more sizable crowd. It was hard to count the crowd as they streamed in impressively toward the start of the march at 10 a.m. My guess is that we were at least 600, with as many as a thousand. 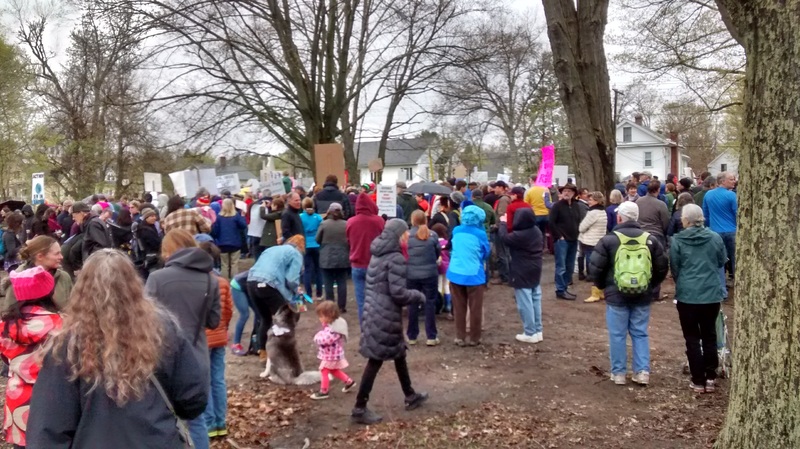 The short march to the Amherst Town Commons meant forming a long queue on the sidewalk. It took a good half an hour for all the people in the park to actually start ambling down the sidewalk. So let’s say there were 800 of us marchers. Considering how few people live in the Pioneer Valley, at least north of the Holyoke Range, 800 is quite a crowd. Aside maybe from football games and graduation ceremonies at nearby UMass Amherst (where many are from out of town), it’s rare to see a crowd of this size around here. It’s kind of unnatural. Which made this march of among the four hundred or so across six continents pretty impressive in the grand scheme of things, at least in terms of per capita representation. We hardly packed them in like they did on the national mall. 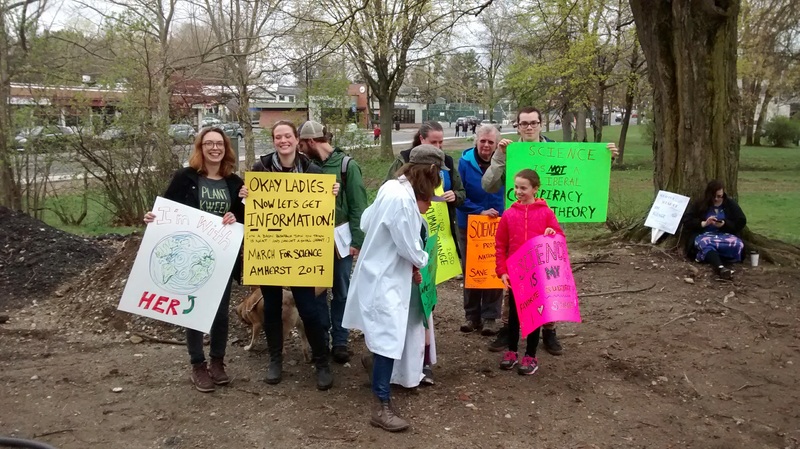 We didn’t have Bill Nye the Science Guy as our speaker, just a local neurologist and a few others from the crowd who came forward before we marched. It was all very low-key and had a spontaneous feel to it, organized as a lot of these are in a few weeks using a Facebook group and depending a lot on word of mouth. Our neurologist spokesman in the lab coat spoke about how ironic it was to have a march for science. No one ever recalled this being done before. That’s because until recently the idea of a march for science seemed absurd. It’s kind of like marching for sunny days. This was of course before our Electoral College unwisely put into office a president who doesn’t believe in climate change, and whose head of the EPA is working to turn it into the Environmental Degradation Administration. So the march had a very surreal feel to it, as the virtues of science should be obvious to anyone with at least half a brain. For much of our country’s history, we were proud of our scientific achievements and our scientists. Like Albert Einstein, they showed up on our stamps. Those of us who remembered the space race remember how science was supercool back then. It also brought forth the information age, evidenced by the smartphones most of us carried, each with enough power and circuitry to best the computer that in 1997 beat chess champion Gary Kasparov. Science has also extended human life enormously, helped provide the means to feed our exponentially expanding population, cleaned much of our air, put a man on the moon and has at least one spacecraft actually traveling between stars. Who could possibly be against that? It turns out plenty of people are against it, at least when it interferes with their agendas. For science whether it likes it or not tends to be a disruptor. It provides incredible advancements and insights but it does so sometimes by offending those who don’t like what it reports. Science discerns what is, but not always perfectly. As science gains better insights into reality, what we thought was reality sometimes gets revised. And that’s also why some people are offended. Science can find no God that matches the one we are told exists in our Bibles or Koran. If it could I’m sure scientists would be first to broadcast the news. Scientists aren’t saying there is no God, but that science doesn’t reveal one. A process that requires peer review and skepticism is of course perceived as a threat to those who depend on ignorance to retain power. And thus the absurdity of a march for science. But we live in an age of alternative facts, an oxymoron so enormous it’s hard for the rational among us to put our brains around the notion. To say you believe in alternative facts essentially says that you suffer from profound cognitive dissonance. If I arise around 7 a.m. and look to the east I am likely to see the sun rise. In the world of alternative facts, it could be a sun setting, or not a sun at all. Perhaps it is the hand of God, or the hand of Manos. So perhaps we were not marching for science, but marching for reality. As one of the more popular signs at yesterday’s rally said: “There is no Planet B”. And that pretty much says it all. We march not just for reality, but for our lives and those who come after us. To deny reality means to doom humans as a species on this planet. To deny that pumping more carbon dioxide, methane and greenhouse gases into the air and think it’s not causing the atmosphere to warm is really insane. Your local science teacher can prove it pretty simply in a test tube in the chemistry lab of your local high school. If you are going to dispute that then either you are denying reality or you are doing it to gain short-term advantage and profit for you and people like you. It doesn’t matter which it is, because it is evil. I am convinced that we are nearing the end of this anti-science age. This cannot stand because to deny reality means death itself. If there is one phobia we all share it’s a fear of death. Which makes science deniers evil and if they actually believe what they preach likely clinically insane too. Marching for science is marching for reality. We all want to live. We will not allow those who lead us to kill us.